Logo for the campaign Trick-or-Treat for UNICEF. From 1946 to 1951, Reverend Clyde M. Allison worked for the Presbyterian Church in the U.S.A. (PCUSA) Board of Christian Education  in Philadelphia, PA, as Associate Youth Editor. During his tenure, he published the popular Junior-Hi Kits, where the first inkling of the program that became Trick-or-Treat for UNICEF  (United Nations International Children’s Emergency Fund) was born. 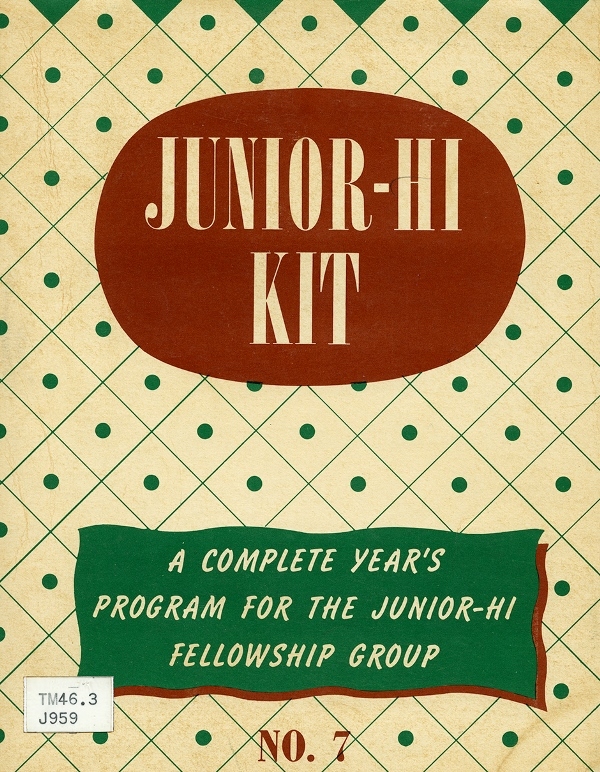 Cover of Junior-Hi Kit, 1950. Image no. 4875. The initial Halloween programs promoted by the Board of Christian Education in the late 1940s called on Presbyterian children to collect specific items for relief efforts in war-ravaged Europe--namely shoes and soap. Those items were collected and sent overseas through Church World Service. 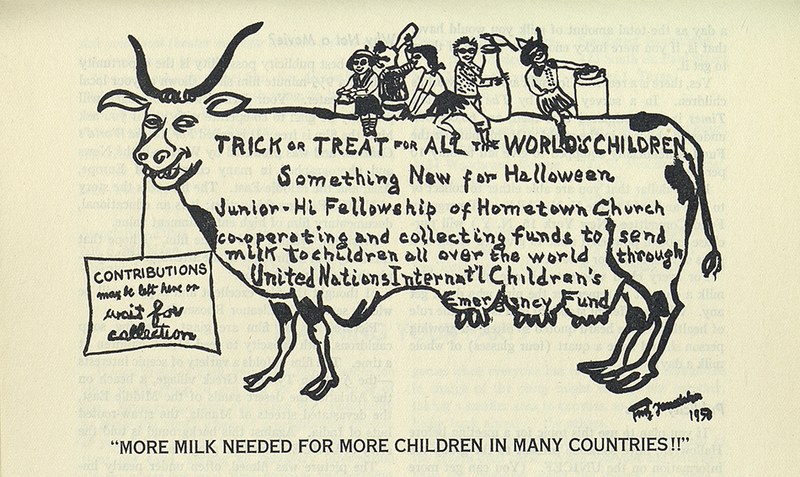 The 1950 Junior-Hi Kit, a curriculum resource distributed by the PCUSA Board of Christian Education, featured a project for Halloween titled “Trick or Treat for All the World’s Children.” The special interest that year was collecting funds for UNICEF to send milk abroad to children who would not otherwise have any. 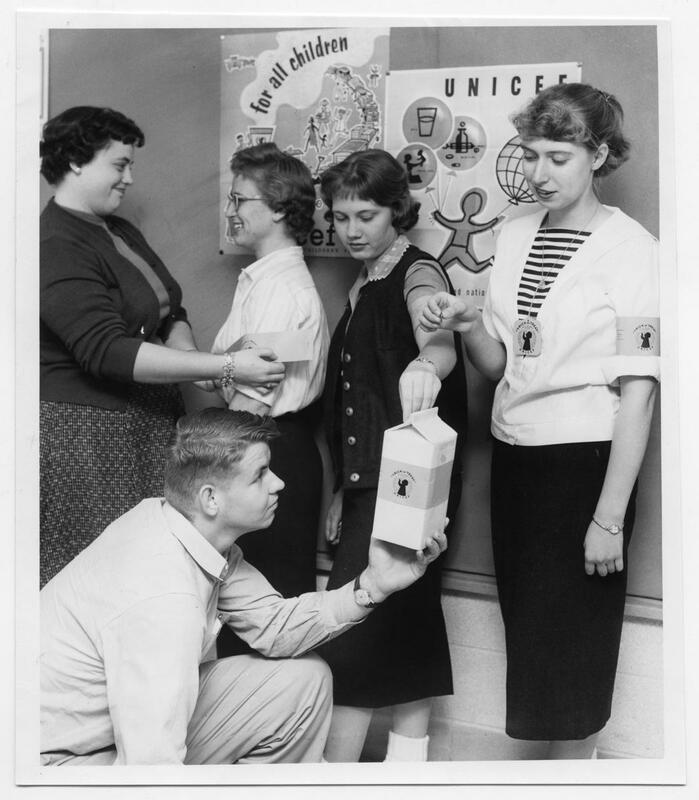 The curriculum suggested that children use paper milk boxes to hold their money or washed-out milk cans with slits cut in the tops as collection banks. The milk cartons eventually gave way to the ubiquitous orange collection boxes. Reverend Allison practiced what he preached. In October 1950, he and his wife Mary Emma, along with their three children Monroe, Margaret, and Mary, went out trick-or-treating in their Philadelphia neighborhood to collect donations for UNICEF instead of candy. The Allison family’s efforts brought in only $3.00 that night, and a mere $17.00 was raised throughout the Philadelphia area during that first year. And yet the project caught on in the coming years, spreading across the nation. Soon thousands of young people of all faith traditions around the United States were collecting funds for UNICEF on Halloween, a tradition that continues to this day. Columbia, Missouri, high school students take part in Trick-or-Treat for UNICEF, 1958, Religious News Service photograph. Image no. 4874. As Trick-or-Treat for UNICEF celebrates 65 years in 2015, it continues to encourage children to help others their age. So far, the project has raised more than $175 million for the U.S. Fund for UNICEF. That is no small change, in keeping with the project's important influence around the world. Early Trick-or-Treat for UNICEF collection box. Kids Trick-or-Treating for UNICEF . 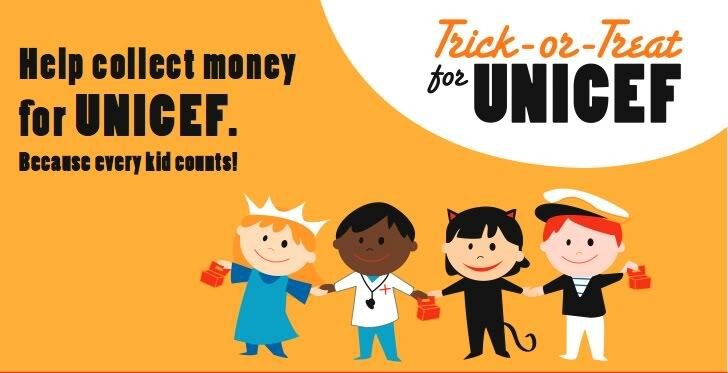 To learn more about UNICEF's Trick-or-Treat project today, click on the image below. Trick-or-Treat for UNICEF promotional poster.